This roulette taste very refreshing and is a perfect piece for dessert. All of my kids love it with a cold glass of milk. 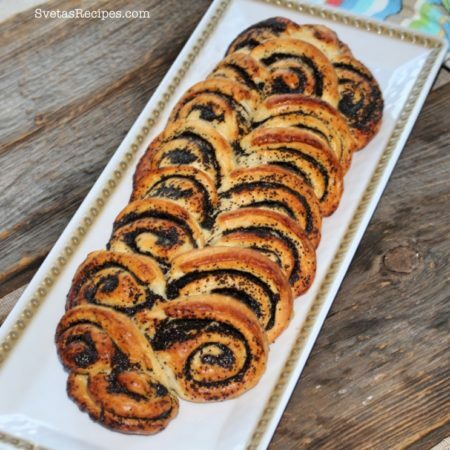 I would definitely recommend it, this recipe makes 2 roulettes. In my house it didn’t even last a day. 1.) In a large bowl add warm milk, sugar, and yeast. Then cover the bowl with a paper towel and let it rise for 20 minutes.Continuing add your olive oil, melted butter, and vanilla extract. 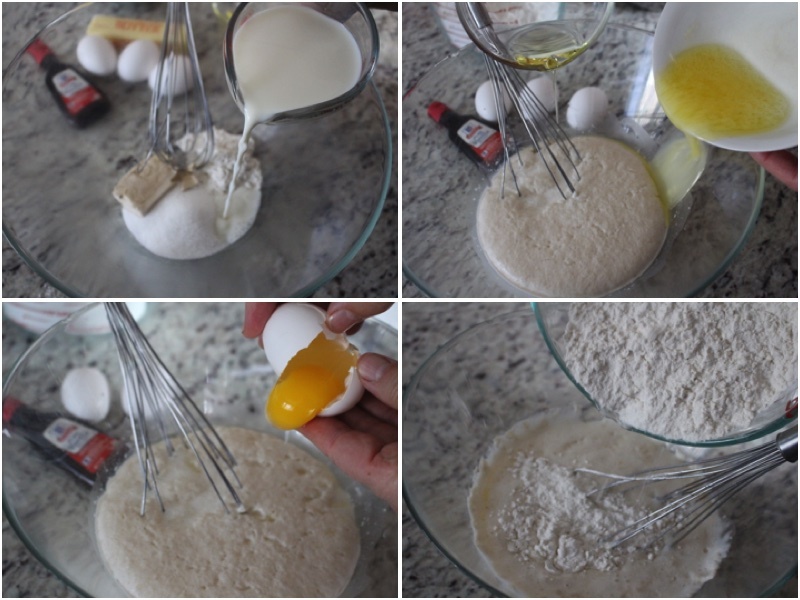 Then add your eggs, mix together well and add your flour. 2.) Put your dough on a lightly floured surface and kneed until you have a smooth and elastic dough. Place your dough back into the bowl and cover with a paper towel, let it rise for 45 minutes. 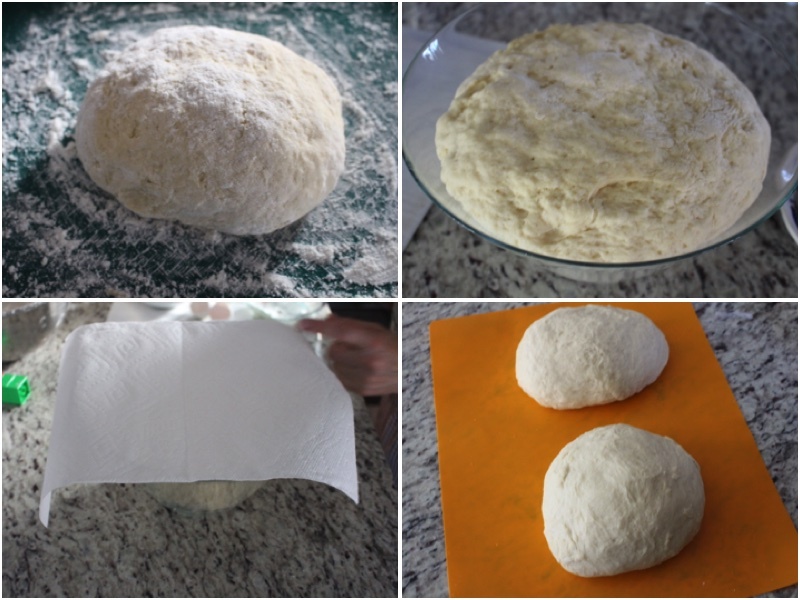 Split your dough into 2 pieces. 3.) 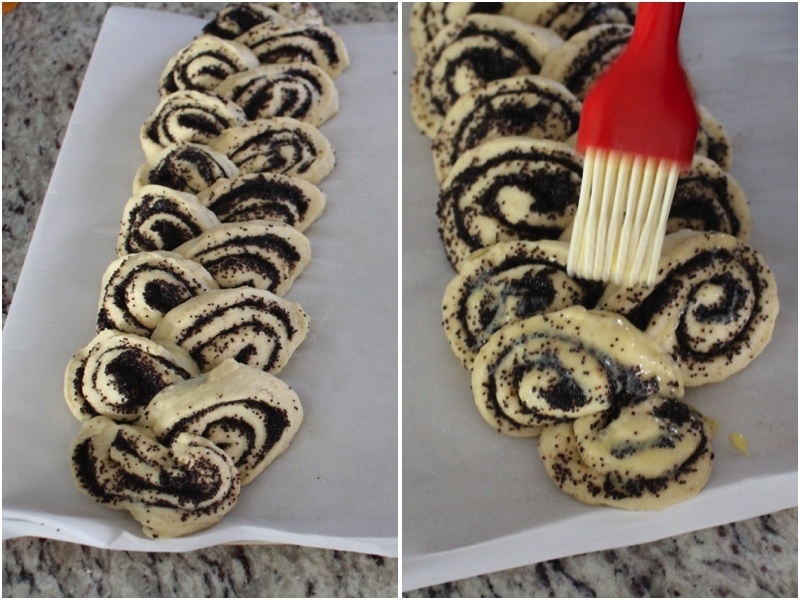 Roll out your dough and then spread butter poppy seeds on top of it, roll it into a roulette. After make slits with a knife 3/4 in every half inch. Using your hands put each piece opposite of this previous piece as shown in the photo. Preheat your oven to 350ºF. 4.) Place your roulette on a baking sheet. Using a brush spread your mixed egg yolk on the top of both roulettes. Place on a baking pan and bake for 30 minutes on 350º F. Cut, Place on a serving dish and enjoy. This roulette taste very refreshing and is a perfect meal for dessert. All of my kids love it with a cold glass of milk. I would defiantly recommend it, this recipe makes 2. In my house it didn't even last a day. In a large bowl add warm milk, sugar, and yeast. Then cover the bowl with a paper towel and let it rise for 20 minutes.Continuing add your olive oil, melted butter, and vanilla extract. 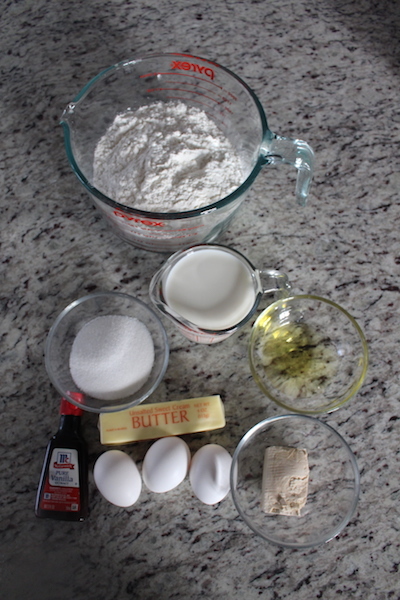 Then add your eggs, mix together well and add your flour. Put your dough on a lightly floured surface and kneed until you have a smooth and elastic dough. Place your dough back into the bowl and cover with a paper towel, let it rise for 45 minutes. 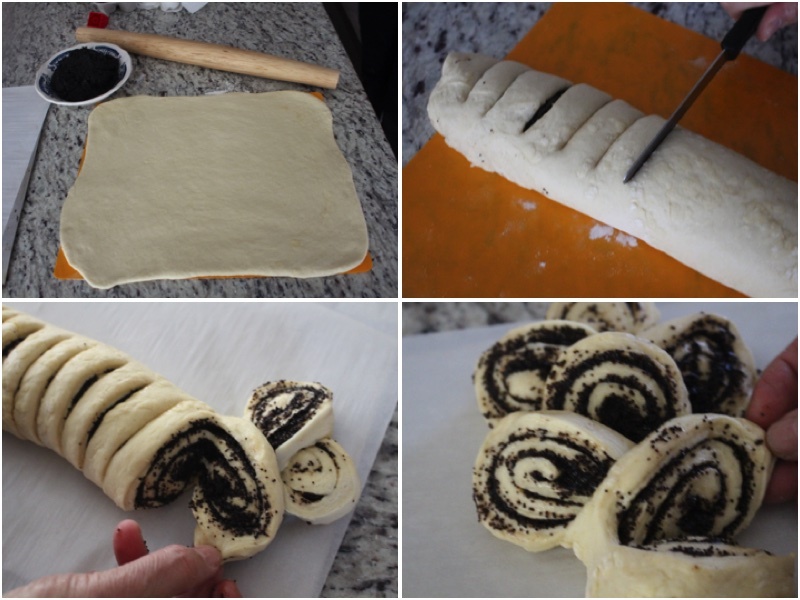 Split your dough into 2 pieces. 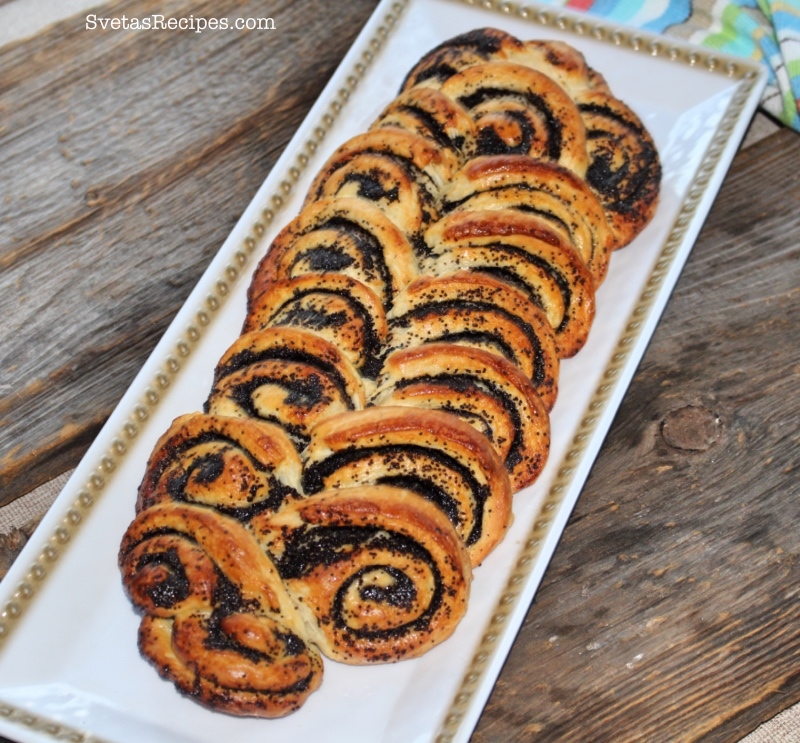 Roll out your dough and then spread butter poppy seeds on top of it, roll it into a roulette. After make slits with a knife ¾ in every half inch. Using your hands put each piece opposite of this previous piece as shown in the photo. Preheat your oven to 350ºF. Place your roulette on a baking sheet. Using a brush spread your mixed egg yolk on the top of both roulettes. Place on a baking pan and bake for 30 minutes on 350º F. Cut, Place on a serving dish and enjoy.